This is how I tram my mini-mill. I think the method I use is fairly common, although I may use slightly different equipment than others. There are other ways of doing it and some people have strong opinions about which way is best. I’ve included links at the bottom to some interesting discussions I found if you would like to learn more. If you don’t know, tramming is the process of adjusting the mill’s column so the spindle is perpendicular to the table. By the way, this procedure only trams the X-axis. Unlike most other mills, the mini-mill’s Y-axis is not adjustable, although there are ways of doing it if you’re willing to go to the trouble. I started using the arm from a magnetic base because it was the quickest and easiest way to mount a dial indicator so I could read it from the sides of the mill. It replaced a home-made one that had the DI facing forward (good) and to rear (hard to read). If your mill vise is big enough you can measure on the top of it with a dial test indicator (DTI) and tram your mill that way. The vise shown in the picture is probably big enough to do that. But the screwless precision vise I often use isn’t, which is why I use the 1-2-3 blocks, a trick I learned from someone else. The blocks will also allow you to tram your mill without removing the vise. I also believe you can get better results by taking your measurements farther apart. Before you get started you should swing your indicator from one side to the other a few times to make certain you get repeatable measurements and there is no “play” in your setup. You should also center your table under the spindle and make your measurements on its center line and at the same spots each time. You should know that tramming your mill’s table does not guarantee your vise will hold your work pieces square with the spindle. It should if it was made properly. If it doesn’t you should find a way to fix it, consider getting another one or tram your vise instead of the table. I’m talking about your vise being square with spindle, not with the table. That’s also important, but it’s different topic. One way to check your vise is to tram your table, mount a long parallel in it, and then measure at the ends of the parallel with your indicator. It should be just as perpendicular to the spindle as your table, or pretty darn close. In the past I’ve always trammed my mill using a traditional dial indicator with a needle and dial. Sometimes it would take me just 2 or 3 minutes but other times I’d be scratching my head for 10 or 15 minutes and wondering what the heck I was doing wrong. It was usually because I’d gotten confused reading my “analog” indicator, which is easy is for me because as an amateur machinist I don’t use one very often. So the last time that happened I took my old indicator off and replaced it with the new digital dial indicator I’d bought from Harbor Freight for about $25 (with a 20% off coupon). It instantly put an end to my confusion. The procedure is simple with a digital indicator. Swing your indicator to one side and zero it. Then swing it to the other side. If the measurement is “negative” then push the column toward that side half the distance shown on the indicator. If your measurement is “positive” then push the column away from that side half the distance shown. Then zero the indicator again and swing it to the other side to check your work. You want to try to get the same distance on each side, although I wouldn’t worry too much if you’re only off a thousandth or so over a good distance (my setup takes measurements about 10-inches apart). If your indicator has a needle, then use it to find out which side has the shortest distance between the indicator and the table, and then “zero” it or write down the measurement. Then swing it to the other side, calculate the difference in length and push the column toward that side half that distance. Before you can adjust the column you’ll obviously have to loosen the big nut on the back of it a little. There’s a good chance that the column will move slightly when you tighten it again, so re-check the tram. I’ve found you can minimize that if you loosen the nut just enough to allow you to move the column by gently tapping it with a rubber mallet. Practical Machinist Forum: How to tram a mill for best surface finish / flatness? I use disk brake rotor to tram with. 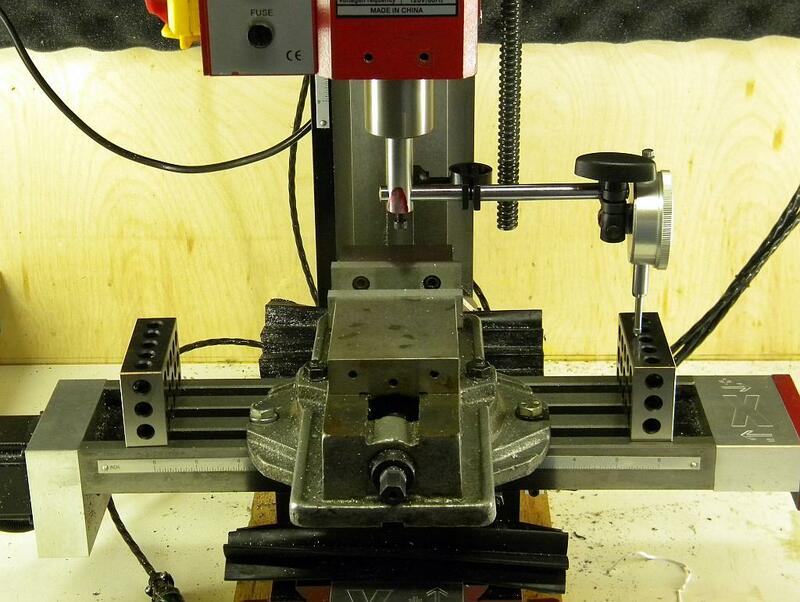 They are made to very close tolerances, and with one setup I can easily check both X and Y axes. Using the rotor does require removing the vise though, so a bit of time is lost clocking it back in. I also found that a DI with a back plunger keeps the dial facing up so it is always easily readable.